HAWTHORN'S premiership defence appears in tatters after West Coast turned out a dramatic 20-point win and banished the visitors to the bottom eight at Subiaco Oval on Saturday night. Nic Naitanui had a quiet three quarters, but his second game will be remembered for three thrilling fourth-term goals that sealed the game for West Coast and turned the draftee into a hero. With Hawthorn gripping desperately to a four-point lead in the middle stages of the term, Naitanui smothered Jordan Lewis' clearing effort, baulked around the Hawk and gave West Coast the lead. He swept on a loose ball in the goal-square minutes later and when he stole another from Tom Murphy in time-on and raced his way into range, the Eagles were 26 points clear and home for their fourth win of the season, 16.11 (107) to 13.9 (87). The vicious conditions that engulfed the game prompted severe weather warnings, but they weren't enough to alter Hawthorn's short-kicking game plan as it fell on its sword. Sam Mitchell (40 possessions, 13 clearances and 10 inside 50s) was the standout player on the ground, but when the Hawks needed to use the breeze and build an unassailable lead in the third, they were too precise and pretty, getting themselves just three points clear at the last change. 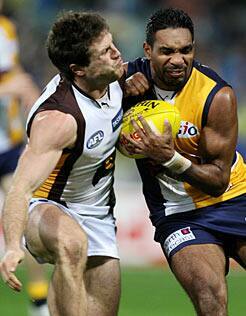 While Naitanui earned the headlines, the Eagles were well served by an army of their other youngsters. Second-year players Brad Ebert (24 possessions) and Chris Masten (27) put in polished performances, while Scott and Adam Selwood provided the muscle. Quinten Lynch stepped in for Dean Cox and led the ruck with 23 hit-outs and 26 touches, while Matt Priddis held the midfield together with 35 possessions. Brad Sewell (32 possessions) aided Mitchell in the clinches for Hawthorn, while Jarryd Roughead (five goals) made the most of his opportunities. Lance Franklin booted four goals, but three of those were from the goal square and Eagles defenders Darren Glass and Eric Mackenzie did plenty to hold the star Hawk. A merciless wind was ripping across Subiaco Oval and favouring the Hawks in the first, but they were unable to take full toll of the advantage in a tight and physical opening. Roughead got the first goal after Shannon Hurn chose not to rush a behind under pressure, and it was another relatively new rule that gifted the Hawks their second. First-year Eagle Tom Swift jumped through the interchange gate with Andrew Embley coming off, and Mitchell was awarded the free kick and 50m penalty. Mark LeCras, who finished with four goals, kicked his first after some brilliant ruck work from Naitanui, and his second levelled the scores. Glass and Mackenzie were sharing duties on Franklin, and his two easy late goals from the square would have angered both as the Hawks took a 12-point lead into the first break. Roughead again booted the opener in the second, but, with a stiff breeze at their backs and an inclination to kick long, the Eagles went on to boot six of the next seven goals. Embley and LeCras pegged back the Hawks' margin and when Mitch Brown booted a spectacular goal from just outside the centre square, scores were level. To emphasise the value of the breeze, Ebert effortlessly kicked a major from 55m out off a few steps, Tyson Stenglein converted and LeCras sent West Coast into half time 14 points clear. It didn't last long, however, with the Hawks booting the next four goals as conditions worsened. Campbell Brown, Michael Osborne and Franklin converted, and the run took place without the influence of Mitchell, who was being held by Daniel Kerr. Roughead and Franklin had four each late in the term, but a defensive bungle from young Hawk Murphy allowed Kerr to run into an open goal square, leaving the Eagles three points down and sensing a kill. David Wirrpanda set up a dramatic finale with a quick goal to open the fourth, before Naitanui arrived and gave the Subiaco crowd a night to remember.